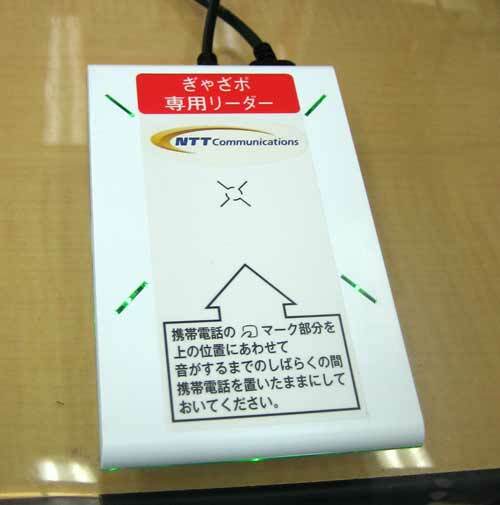 When I visited NTT Communications last October for a private demo of its new cellphone RFID loyalty-card system, it was still in its early stages of development, so there wasn’t a great deal to write home about at the time. Nevertheless, Gyazapo (from “Gather Points” - yeah, I know) looked extremely promising, something that NTT made abundantly clear at a public demonstration at a Bic Camera store in Tokyo this morning ahead of a four-month real-world trial. The system aims to take all an individual’s loyalty-point cards from various stores – video rental, gas station, coffee shop and so on – and hold them on a single RFID chip inside a phone. One of the big selling points of Gyazapo will be the fact that it saves companies cash by cutting out physical cards, as well as cuts down on the clutter in the typical wallet or purse. As you might expect, NTT also talked about the environmental angle of not using any plastic. In operation, Gyazapo is relatively simple – the shopper just presents an Osaifu Keitai/FeliCa-equipped phone at a reader/writer terminal and that pulls the appropriate user data from one of up to 100 separate storage areas on the chip. NTT software called Key-Shuttle manages the information on the phone, acting as a gateway between the retailer and the customer data. The fact that it does so securely and doesn’t allow stores to access data from other vendors is likely to be a major draw. The system isn’t entirely automated, as the next step involves it displaying the barcode associated with that customer on a dedicated mini display, which the shop clerk then has to scan as they would a traditional loyalty card. There are various configurations possible, but the basic point of this step is so Gyazapo can be used with existing reward-point systems. After that, it’s business as usual, with the option to use or save points and the resulting balance written to the appropriate area in the FeliCa chip. Existing RFID loyalty systems each require a separate Java application to function, whereas Gyazapo combines the lot into a single app, plus it can handle far more variables. Future uses, for example, might include photo identity cards, hospital inpatient data and the oh-so-Japanese seiri-ken tickets that confirm one’s place in a line. Personally, I don’t carry reward cards simply because of the bulk of all those lumps of plastic. 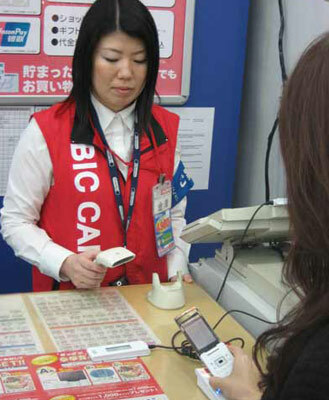 However, I do use Bic Camera’s own Java app for their points system and find it simple to use. Obviously, I wouldn’t want to have to launch a new application in every shop. If NTT can get the phone networks to pre-load Gyazapo’s Key-Shuttle software on new phones and make it simple to set up, then I can see it becoming as ubiquitous as the SuiCa e-cash/travelcard system is now. We should know towards the end of this year.